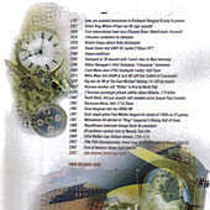 Offers a chronological timeline of important dates, events, and milestones in Montana history. Beginning some 2 million years ago, however, dramatic temperature changes profoundly altered what we now call Montana. At four different times, great sheets of glacial ice moved south through Canada to cover much of the north. The last glacial retreat, about 10,000 years ago, did much to carve the state's present topographic feature. Montana's first humans probably came from across the Bering Strait; their fragmentary remains indicate a presence dating between 10,000 and 4000 BC. Native Americans known to have inhabited Montana at the time Europeans first explored it included the Blackfoot, the Sioux, the Shoshone, the Arapaho, the Kootenai, the Cheyenne, the Salish, and others. 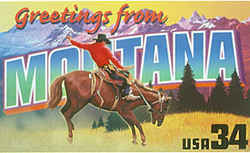 1680 - Montana natives acquire the horse. 1720 - Montana natives acquire the gun. 1847 - Fort Benton founded on Missouri River as military and trading post; soon becoming world-renown "Head of Navigation" to the west, and world's furthest inland port. Steamboats brought gold seekers, fur traders, settlers and supplies, making Fort Benton the "Birthplace of Montana." 14 July, James Stuart becomes first lawman in Montana History, elected sheriff of Gold Creek with jurisdiction covering most of Western Montana. Served to April 1863. May, Crawford resigns and returns home to an eastern state. Outlaw gang leader Henry Plummer elected sheriff of Bannack and all gold camps southeast of the Bitterroot. 29 June, Chief Deputy Donald H, Dillingham of Virginia City, becomes first lawman killed in the Line of Duty, assassinated in broad-daylight on Virginia City's Main Street by two of Plummer's deputies. December, 102 known killed and over a quarter million dollars in gold (at 1863 prices) stolen by Plummer's "Road Agents" gang. Outraged citizens form Vigilante Committee, and within five weeks 21 gang members hung, countless others banished from Territory. 26 May, Montana Territory officially created by act of President Abraham Lincoln, Bannack chosen as first Territorial Capitol. 1865 - Montana's first US Marshal appointed by President Lincoln: George M. Pinney, serving from 1865 to 1867. Pinney first sets up his office in Butte, later moving to Helena. 1866 - US Military Post, Camp Cooke, created on the Judith River. 1873 - Beginning of Royal Canadian Mounted Police, to "destroy illegal whiskey trade and lawlessness" caused by the "Whoop-Up Trail" operation from Fort Benton into Canadian Northwest Territories, the "Trail" having been created by Fort Benton's first sheriff, and subsequently participated in and protected by five of his successors. 24 June, Sioux Indians defeat Col. George ArmB Custer and 7th Cavalry at Battle of Little Big Horn River. Following, Nez Pierce Indian Chief Joseph leads his people out of Oregon into Montana, outwitting superior US Army forces, until surrender in 1877 near Bear's Paw Mountains in northern Montana. 1885 - Montana Territorial Government creates first "state" law enforcement agency: Montana Department of Livestock. 1889 - 08 November, Montana becomes 41st state of United States under President Benjamin Harrison's administration, 16 original counties established, and 16 sheriffs appointed by new state government. 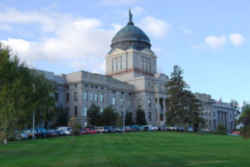 1902 - Montana Capitol Building is completed. 1903 - Amalgamated Copper Company paralyzes the state's economy with the shut-down to force legislative relief. 1909 -Chicago, Milwaukee, St. Paul and Pacific Railroad ("Milwaukee Road") is completed through Montana. forest fires devastate western Montana. 1910-1918 - Homesteading boom peaks on Montana's plains. 1911-1925 - "County-busting" craze creates 25 new Montana counties. 1914 - Montana women receive the franchise (right to vote). 1916 - Jeanette Rankin elected the first woman in the US Congress. Industrial Workers of the World (IWW) organizer Frank Little is lynched in Butte. 1918 - February, Mrs Leo Hunter, Rosebud County Sheriff's Office, appointed first female law officer in state. 1919 - First of severe agricultural depressions (extending into the early 1940s) begins in Montana; oil is discovered in the Cat Creek field. 1921 - Wave of bank failures begins in Montana. 1922 - KDYS (Great Falls), Montana's first licensed radio station, broadcasts. 1923 - Jack Dempsey-Tommy Gibbons world heavyweight championship fight is staged in Shelby. 1926 - Montana artist Charlie Russell dies in Great Falls. 1930 - Significant tourist industry begins in Montana. scores of Civilian Conservation Corps (CCC) camps are established across Montana. 1991 - Riot at State Prison in Deer Lodge results in five deaths. Attorney General Marc Racicot (R) defeats legislator Dorothy Bradley (D) for governor's seat. a generally wet summer produces record agricultural harvests. 1994 - 4,500 wildfires rage across Montana, burning 286,000 acres. 1995 - Wolves are returned to Yellowstone National Park, where they thrive. "Unabomber" Ted Kaczynski captured near Lincoln. 1997 - A prison-population overflow creates a housing crisis for inmates, some sent out-of-state. 1998 - The Montana Power Company sells its electric generating facilities to Pacific Power and Light, Global, Inc.
1999 - As highway deaths rise, Montana reinstitutes a daylight speed limit of 70 mph on 2-lane paved roads. 19,600,000 acres of state and federal land are closed due to fire hazard. wildfires again dominate Montana's drought-beset summer.